Blog | March 2019 | How to Create a DIY Rosette Bouquet for Mother’s Day! Flowers are synonymous with Mother’s Day. A beautiful gift, they brighten up any home with springtime cheer and are sure to put a smile on the face of any mum. But, how great would it be if you could create your own beautiful bouquet to gift? 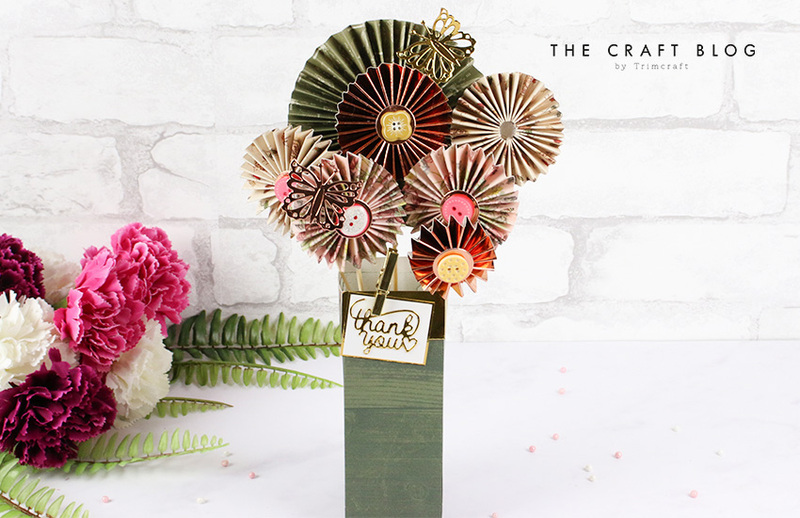 We’ve teamed up with our Design Team member Claire Gladman, who today will be showing you how to create your own Rosette Bouquet, bursting with beautiful handmade paper flowers. So simple to create with just a few folds and scores, these rosette flowers would make the perfect gift for the special lady in your life (or for yourself for that matter!) and she will really appreciate that you’ve taken the time to make them. Whilst these would make a wonderful last minute gift for Mother’s Day, with the sentiment removed or changed, they’d make a lovely project to brighten up your shelf or table. The rosettes can be made to any size or colour and can be decorated for any colour scheme or occasion. For our paper rosettes today, we used the beautiful new Gardenia paper pad from First Edition. With gorgeous nature-inspired designs and colours, they work perfectly for this project and will look wonderful in your home, bringing some floral magic with them. We’re also showing you how to create a quick paper vase for your bouquet as well, although you could use your own to display your paper flowers. We have a free template here to help you create your vase. Read on to find out how to create your own DIY Rosette Bouquet with our handy tutorial. 1. Take a 12” x 12” square of the Gardenia green wood effect paper and cut out the net from the free template. 2. Cut a 2” x 2” square of cardboard and stick to the centre square. 3. Assemble the vase by sticking down the panels to each side and pop in a rectangular piece of oasis to fit. 4. Cut four small rectangles of gold mirror card. Two measuring 1” x 2” and two measuring 1” x 2.2”. Attach these halfway up each rectangle to the top of each side of the box. 5. Cut a 4.1 x 3.2cm square of smooth white card and border with gold mirror card. Die cut a Thank You sentiment in gold and stick to the centre of the panel. Attach this using a peg to the front of the vase. 1. Next, it’s time to make a start on the flowers. For the large flower, cut four 12” x 2” strips of gardenia paper, score at each ½ inch, concertina fold and attach together. 2. Fold inwards, push together and use a glue gun to fix in place. Die cut a 1 ½”circle of rose gold mirror card and attach to either side in the centre. 3. Then create a smaller rose gold rosette using the exact same method but with strips measuring 8” x 1”. Add ¾” die cut circles of rose gold mirror card to the centre of each side, embellish with a button and attach to the centre of the larger rosette using a glue gun. 4. To finish, adhere two craft sticks together and glue gun them up through the back of the rosette. 5. Now create four medium sized rosettes using four 8” x 1” strips using the method above. Then create one smaller rose gold rosette using four 5” x 3/4” strips. 6. Once all the rosettes have been glued to sticks and embellished with buttons, arrange into the vase. 7. Die cut two butterflies from gold and rose gold mirror card and attach these to the flowers. There you have it! You’ve created your very own paper flower rosette bouquet. Perfect for gifting or popping on display in your own home, we think that this is a super versatile make that you can turn to again and again. What’s great is that you don’t need an occasion to create these (even though they’d make the perfect handmade gift for Mother’s Day)! Alternatively, why not turn your rosettes into bunting or a card topper? What did you think to our rosette bouquet tutorial? Will you be giving it a try? Don’t forget to show us your makes in the Inspiration area, or #Trimcraft on social media as we really do love to see what you create. You can also follow Claire on Instagram here, or check out her makes on our blog.